WHAT IS IT? - A music show featuring 6 performers/acts doing 25min sets. WHAT IS IT NOT? - It's not an Open Mic. All performers are booked into their time slots ahead of time. WHEN IS IT? - Every Monday, the show starts at 8:00pm, ends at 11:00pm. WHERE IS IT? 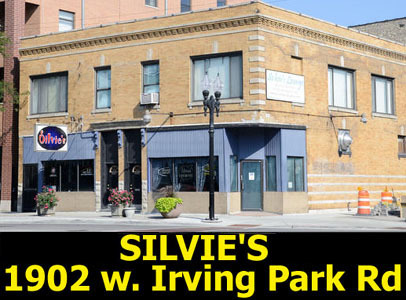 - Silvie's, located on the north side of Chicago at 1902 w. Irving Park Rd. (between Damen & Ashland) [click HERE for map]. WHO IS RUNNING THIS SHOW? - Singer/Songwriter John Kuczaj is the booking agent for this show and also the host. Check out his music - ATOMIC SHOP. ARE THE PERFORMERS PAID? - No pay. IS THERE A COVER CHARGE? - No cover. WHAT IS SUPPLIED? - Silvie's supplies an audio tech, audio & instrument microphones, cables and a music stand for the show. All you need to do is bring your instrument & tuner. CAN I PLAY MY ELECTRIC GUITAR? - Yes! Electric instruments & keyboards are allowed (we have one amp, but feel free to bring your own if you prefer - guitars do not plug into the house). CAN I PLAY COVERS? - Yes, Originals and covers are equally welcome. MY ONLY EXPERIENCE IS PLAYING OPEN MIC NIGHTS, IS THAT OKAY? - Yes! A 25 minute set is 5-7 songs, so the Acoustic Explosion is a great showcase for you to expand your performing experience. CAN I HAVE OTHER PERFORMERS JOIN ME ON STAGE? - Multiple performers onstage are allowed. CAN I BOOK A FULL BAND FOR THE SHOW? - Only for the last slot of the night (10:30pm). Otherwise, in the other slots full drum kits are not allowed (1 snare/djembe is okay). HOW DO PERFORMERS SIGN UP? - Email John Kuczaj directly at: john@acousticexplosion.com - Please include info about yourself including your musical experience, a music link if you have one, stage name if you have one, etc. WHERE CAN I SEE THE UPCOMING SHOW SCHEDULE? - Check out the events posted in the Acoustic Explosion Facebook page. RESPECT & SUPPORT YOUR FELLOW PERFORMERS - All performers must arrive before 7:55pm and stay at Silvie's until the show ends at 11pm. PERFORMERS MUST PROMOTE THEIR SET - Performers must do their own promoting to their friends, family and fans. There are no regulars at the ACOUSTIC EXPLOSION...you play to whomever you draw (or don't draw). - Silvie's is a Cash-only bar. There is a ATM inside ($3 fee). - All performers and ALL patrons must be over the age of 21 - NO EXCEPTIONS!!! - Irving Park Road is metered parking until 10:00pm. The City of Chicago regularly tickets between 9:30-10pm on Mondays, feed the meter or risk a $50 ticket.